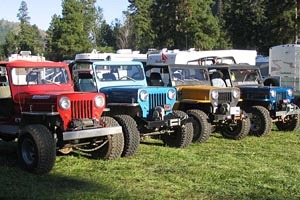 The list of Jeeps on this page includes Willys Jeeps with serial numbers in the normal series (with prefixes 453GB2, 453GC2, 454GB2, OB54, 57348 or 8105). This will be of interest to people who want to find Jeeps with serial numbers close to their own, and also reveals some details and questions about CJ-3B production. Please submit information on your CJ-3B if it is not yet included. We are approaching 2,000 Jeeps on the list. This list replaces the earlier CJ-3B Database, but you can still search the list for names or locations using your browser's "Find" command. This list is ranked in order by serial number. Engine numbers are also included, where available and where the engine appears possibly original, but there are certainly some errors in that area. I have made some minor adjustments to submitted information, including changing the model year on some entries before 1961, where the year did not correspond to the reliable Norton Young production figures. This corrects errors due to the original title being changed or lost, or the Willys practice of updating titles of unsold vehicles at the end of a model year. The list includes the "OB" serial numbers at the beginning of 1954, but does not seem to shed much light upon their significance. Other letters were stamped at the end of the serial numbers of CJ-3Bs exported between 1954 and 1958. The significance of the choice of letters is not clear, but they appear on Jeeps in a number of countries, so they were presumably added in Toledo. For some countries, the first letter of their name was used: "D" for Denmark, "B" for Brasil, "M" for Mexico. "A" appears once in our list, in South Africa, which may be why it wasn't used for Australia. The letters L, R, S, T and U appear on Jeeps sent to Australia. "H" shows up in several different countries. Having more engine numbers might help clarify the significance of the large gaps in the list of serial numbers. Currently there are not enough entries in the areas of the gaps, to determine whether there are corresponding gaps in engine numbers, or whether they increase steadily. Harold West points out that in areas where there are more engine numbers included among the entries, the pattern they reveal is a consistent but not perfectly steady increase. Clearly engines were not installed on the assembly line in exactly the same order they were manufactured. In the Argentinian entries, and in some places in earlier years, the pattern can be clearly seen; Jeeps with serial numbers within ten units of each other or even consecutive numbers, will typically have engine numbers differing by up to 100 or more. (But there is also the fascinating 1964 consecutive pair of 8105130049 and 8105130050, which have engine numbers separated by only two.) In looking at the Argentinian entries, engine numbers in occasional cases are so out-of-sequence that it appears the engines may have been switched between Jeeps during military service. Keith Buckley has done some further analysis of this for us -- see Plotting Engine Numbers. Some Jeeps have engine numbers which are clearly not original, and were taken from another vehicle. Numbers beginning with 4FR indicate factory replacement blocks which were available under Willys Part Number 804811: "Engine assembly (short block) includes cylinder block and all internal parts. Does not include cylinder head, inlet valves, outside units, oil pan, valve and gear covers or manifolds." There is a very large gap of some 6,000 units near the end of the 57348 series in 1964, with just two more entries following it. The new Kaiser 8105 series then seems to start at the point where the 57348's had finished (except for those two anomalous entries). So it's still not completely clear how the switch between the two series was made; those two entries which seem to break the continuity are a puzzle. Knowing how the Toledo factory hated to waste anything, I would think it's not impossible that a few of the old VIN tags appeared on the assembly line and were stamped with numbers from the new series. 1953 453GB2 15427 Connecticut, USA Tom Lewoc Jr.
1953 453GB2 15764 Sao Paulo, Brasil Guilherme Hobuss Jr.
1953 453GB2 17965 1T78162 Pennsylvania, USA Glenn R. Gray Jr.
1953 453GB2 18045 Brasil Edison Vianna Jr.
1953 453GB2 22027 Tennessee, USA James P. Sartain, Jr.
1953 453GB2 30737 Idaho, USA Chuck Anthony . 1954 454GB2 20382 Virginia, USA Archie J. Kendrick Sr.
1954 454GB2 35022 4J68248 Mississippi, USA Robert C Connor, Jr.
1954 454GB2 38418 4J72363TM Colombia Jairo O. Rincon F.
1955 57348 18851B Sao Paulo, Brasil Guilherme Hobuss Jr.
1961 57348 72667 James Wasicki Jr.
1962 57348 85966 4J300980 Texas, USA Burton Fitzsimmons Jr.
1964 8105 122807 Michigan, USA Darrel Miller Jr.
1964 8105 122861 Georgia, USA J. Robert Thompson, Jr. Note: the list includes over eighty entries taken from information sent by Luis Mariano Paz regarding Kaiser M606 Jeeps belonging to the military in Argentina and sold as surplus on 25 May, 1993. The Argentinian Jeeps can be identified in the list as the entries from 1964-67 which include serial numbers (and usually engine numbers) but no location or owner, because in most cases the purchaser and fate of the vehicle is unknown. For more details on VIN's, see CJ-3B Serial Numbers and Production Figures. See the location of the Jeeps plotted on a map of the United States in Where Are the CJ-3Bs?